We offer high quality Northeast Ohio moving service standards time and time again. We have the advantage of being a small business with all of the resources to handle your residential and commercial moving and storage needs. We provide your moving solutions with origination points from Akron, Cuyahoga Falls, Hudson, Kent, Massillon, Medina, Perry, Stow, Wadsworth, and surrounding communities to any point across the United States. RLD Relocation & Logistics is a fully licensed and insured Akron Ohio moving company. Our insurance coverage protects your belongings from where your Ohio move begins to the final destination. Our team can help you decide on the amount of protection you will need and explain the price structure for each plan from general liability insurance to full-replacement value insurance. RLD ‘s equipment is well maintained and operated by highly experienced moving professionals. Our up-to-date, fully-equipped moving trucks are specifically designed to help reduce the chance of goods being damaged in transit. We have a fleet of clean, protective, air-ride moving vans, new cotton fabric protective furniture pads, and mechanically sound dollies and four-wheelers to ensure your furniture and belongings are well cared for. RLD wraps all of your items securely in clean protective cotton pads to prevent scratches and other incidental damage from occurring before they are moved. We pack each box with the utmost care ensuring that each box is labeled with an accurate description of the contents inside and what room it came from, and where it is going to, for your convenience. Extra Special attention is given when moving more fragile and delicate items upon your request. Whether you are moving from Akron, the surrounding areas, another Ohio destination, or across the country, RLD Relocation & Logistics wants to help you make your move as smooth and stress-free as possible. No two moves are exactly the same, therefore, please complete our free estimate request form to schedule an in-home move estimate that will provide you with a thorough assessment of your individual moving needs, and give you a comprehensive and accurate move cost estimate. We are dedicated to supporting you all the way through your move process. We are here to help. We will get the job done. 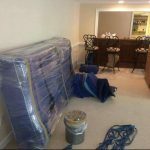 All of your belongings are wrapped in protective moving pads for added protection against minor damage during your move. RLD Relocation & Logistics in Akron Ohio— customer care and satisfaction are our top priority when providing your Northeast Ohio moving services.